I love ice cream! That is why I had to make Smore ice cream pops! We are a ice cream kind of family and in the summer time it feels like the perfect time to try new recipes! You can’t go wrong with homemade ice cream and s’mores??? Right??? This recipe looks so fancy and like you slaved over the stove for hours and the truth is, it’s super simple! My family thought they were better than Drumsticks and they love them! In a large pan, combine the half and half with the marshmallows. Cook on a low heat, stir constantly until the marshmallows are completely melted. Remove from the heat and let cool for a couple of minutes. Place in the fridge to cool for 20 to 30 minutes, until chilled and slightly thickened. If you leave it too long, it will just be harder to work with. In the meantime, whip heavy cream until you have peaks. Fold the cooled marshmallow mixture and add vanilla. Stir until everything is combined. Set out small paper cups, we used Dixie cups, and scoop ice cream into the cups. Push ice cream down to remove any air pockets. Place a popsicle stick into the middle of the pop, almost to the bottom. Place paper cups on a cookie sheet and place into the freezer. Pour chocolate chips into a microwave safe bowl. In increments of 30 seconds, cook chocolate chips in the microwave, stir in between. Continue until chocolate chips are melted and smoothed. Place graham crackers into blender to make the crumbs. Pour onto a plate. To assemble: Peel paper cups off the popsicles and discard. Dip into room temperature chocolate sauce. 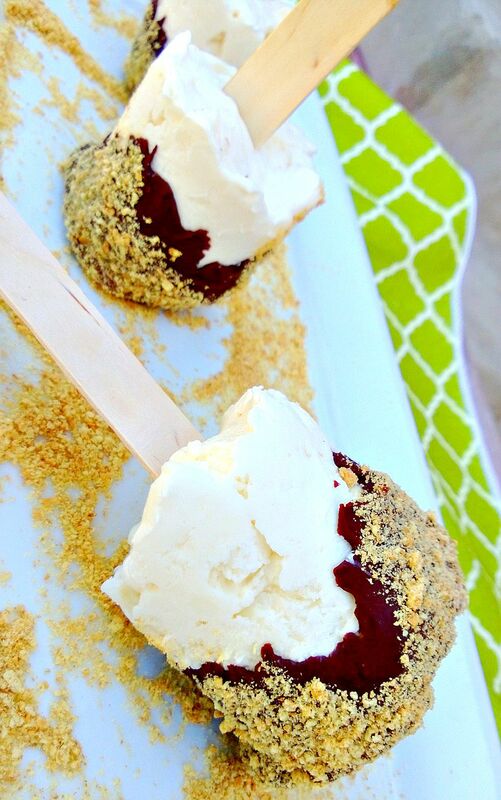 Roll popsicle in the graham cracker crumbs and set onto a tray. You can love them right now or place them in the freezer for later! These look amazing! I am going to make these for sure! Thanks for posting on the Monday Funday Party! 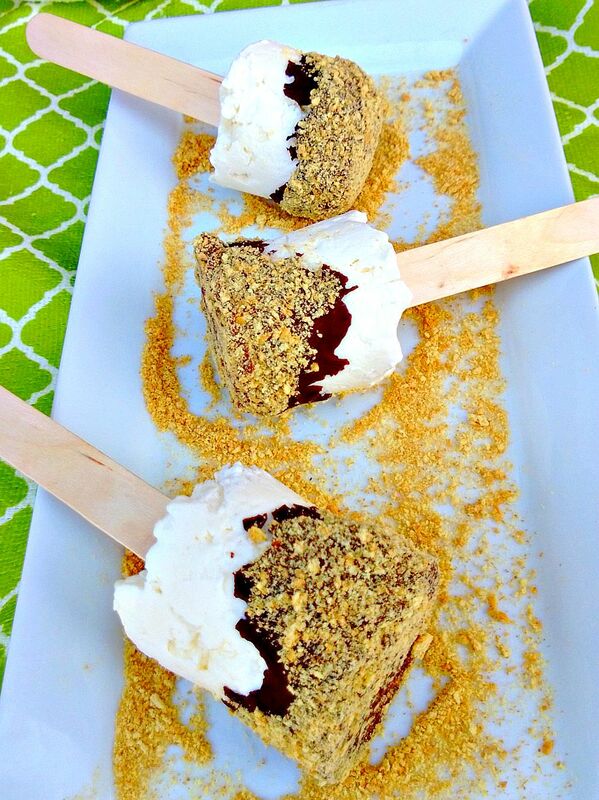 This is such a fun take on a s'mores treat! I absolutely love that they look like skewered marshmallows! This sounds so delicious! Definitely going to have to try it sometime! Definitely need to try this, my kids love s'mores! This sounds so refreshing and tasty, pinned! 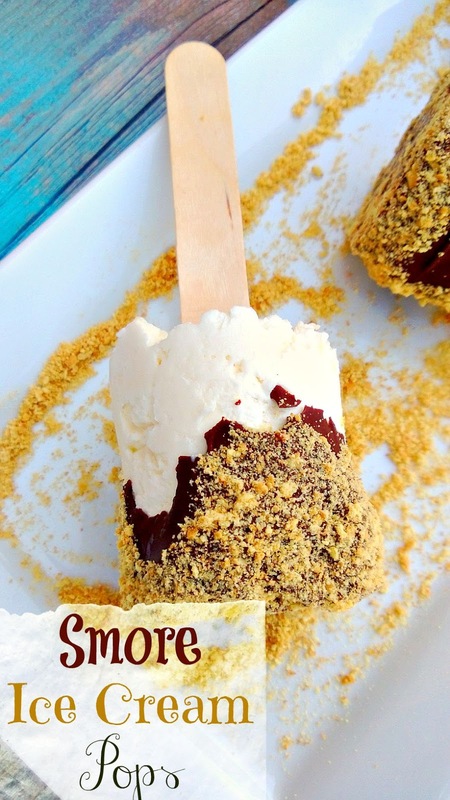 Pinning and sharing your recipe – love these S'mores Ice Cream Pops! They look like such a treat. Thank you for sharing with us at the Hearth and Soul hop. I am so obsessed with smores recipes! I gotta try this one out. Pinned! Come by my weekly link-up and share some of your recipes there. I would love to read more from your blog! I love anything smores, but these look so rich and tasty. Pinning to share! Thanks for sharing your smores, chicken casserole and trail mix on Friday Features, always a pleasure to have you stop by!! Thank you so much for linking up to Merry Monday this week! You are my featured pic of the week! I am sharing your yummy post tomorrow on my blog & social media! We hope to see you next week for another great party! Have a great week! What a delicious recipe! Thank you for sharing, and linking up with us at the Best of the Blogosphere! Can't wait to see what you link up tomorrow! Oh Yummy!!! Thanks for sharing on My 2 Favorite Things on Thursday!! I love having you! Hope to see you again on Thursday! Pinned! These look so good! What a fun twist on a classic sweet treat! Kimberly, you've outdone yourself this time. These ice creams look delicious. I can't wait until it warms up here downunder. I'm sure my kids will devour them. I'm featuring this one at tomorrow's party. Can't wait to see what you bring this week. These look awesome and just right for my kids! Pinned! Okay, so I'm just going to say it: BRILLIANT idea! No matter who sees these, I'm sure they are reminded of just how much fun summer can be! Thank you so much for linking up with us at the Thank Goodness It's Thursday link party! I can't wait to see what you bring to the party tomorrow. What a great idea! I did a version of s'mores this week too. Thanks for sharing at Home Sweet Home!